Hello eGPlearners, in this news update- covering the big stories for primary care over the past week…. 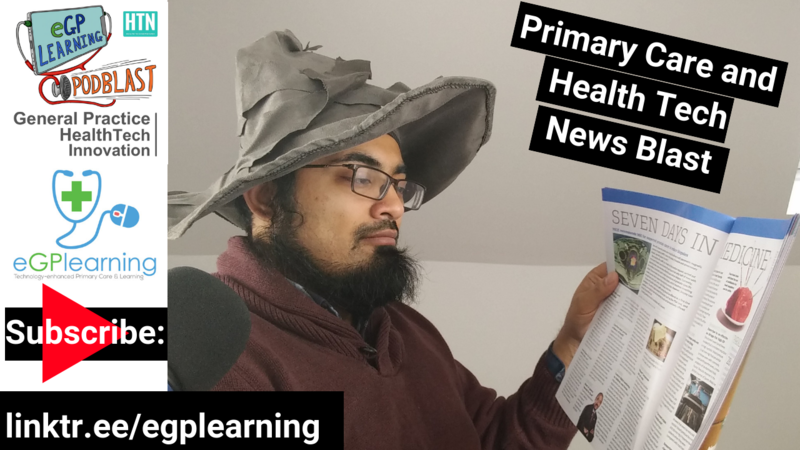 If the first time we are meeting Im Dr Gandalf of eGPlearning where I look at supporting you with technology-enhanced primary care and learning so don’t forget to subscribe and ring the bell to be the first to get notified of all these updates. This piece of the future of General practice was released on Monday 14.1.19 as led by Nigel Watson with seven recommendations at the heart of the review. Recommendation 1: There are significant opportunities that should be taken forward to reduce the personal risk and unlimited liability currently associated with GP partnerships. Recommendation 2: The number of General Practitioners who work in practices, and in roles that support the delivery of direct patient care, should be increased and funded. Recommendation 3: The capacity and range of healthcare professionals available to support patients in the community should be increased, through services embedded in partnership with general practice. Recommendation 4: Medical training should be refocused to increase the time spent in general practice, to develop a better understanding of the strengths and opportunities of primary care partnerships and how they fit into the wider health system. Recommendation 5: Primary Care Networks should be established and operate in a way that makes constituent practices more sustainable and enables partners to address workload and safe working capacity, while continuing to support continuity of high quality, personalised, holistic care. Recommendation 6: General practice must have a strong, consistent and fully representative voice at system level. Recommendation 7: There are opportunities that should be taken to enable practices to use resources more efficiently by ensuring access to both essential IT equipment and innovative digital services. From a digital perspective recommendation 7 is key. Updating systems and allowing innovation must happen, Digitising records would be a major support to practices and help to tackle another uncosted area on subject access requests. Taking this burden away from partners would be very useful. Also working better with statutory organisations for reports for DWP and DVLA would be helpful and reduce considerable administrative burdens on practices. In this past week I have done three reports for the same patient all relating to the DWP- one unified system would reduce unnecessary workload. Updating our IT infrastructure ad policies more in line with consumer tech is also a must. Tackling the ‘computer says no’ mentality due to a reliance on legacy IT would allow primary care to truly innovate, and I eagerly await the day I do not have to use internet explorer 8 in practice. Many will know I have been critical of the interim review which was published last year. The final review is, however, a good document that identifies the challenges facing partnership and also commends the positive impact the partnership model has in primary care. Several of the recommendations are high quality and call on other pieces of work to deliver an improvement for partnership in practice- particularly the call for a sort out of indemnity and the premises review. I do still feel strongly that a key piece lacking is a direct request to increase the global sum funding for practices, as this would significantly and rapidly improve the partnership the workload impact for partners and attract more staff making it more viable and sustainable. I do still see this as a major omission of the review which is in the terms of reference. It should have been requested and using the long term plan as the vehicle to suggest increased funding does not directly help as this still requires increased work for new money, rather than offer a stabilising impact. However, I do feel continuing to state the review is not fit for purpose is not true. The case studies are useful. I do maintain that much of the data collection could have been done rapidly online and not needed a UK wide roadshow to deliver on the review, but accept that the data and narrative is helpful. A key question moving forward is how much of this review will be implemented moving forward. As an addition for those in Nottinghamshire, see this excellent summary by the Nottinghamshire LMC chief exec – Michael Wright with useful supportive links. Speaking of Nottingham according to a breaking story today Rushcliffe (where I live) is the most well-covered GP area in the country. A stark contrast to where I work- St Anns which is in the second worse category for coverage- areas only 2 miles apart. While many, especially will claim this is shocking news, to those who work in primary care it will be obvious. People work where there is a better work-life balance or income. The challenges of working in rural and inner-city areas in comparison to suburbia can be ignored and tackling health inequalities is paramount. After a patient objected to seeing a Doctor because she was Asian this excellent reply by the reception team highlights the challenges many people still face. One area to consider is the institutionalised prejudice about choosing the gender of the clinician you may see. While there are many cultural and preference reasons for a woman to want to see a woman and similarly for a man to see a man, it can be argued this is still prejudiced that in some areas is supported by some CCGs and area teams insisting practices offer daily appointments with both male and female clinicians regardless of the organisation size. Is this appropriate? As seen in this story when chosen by race it is abhorrent but choosing gender is more acceptable? What a confusing way to define prejudice. This has been a hot story over the week and likely to develop further. Anyone working in primary care will know about the challenges of obtaining certain medications, whether a doctor, nurse pharmacist and indeed patient. Last week I commented on the challenges about Rivaroxaban. Now this story has broken to the wider media. generic companies unwilling to keep creating unprofitable items. Part of the challenge is also created by the brand switching and use of branded generics by medicine management teams to bring down the costs for CCGs. While this has led to an ‘on the books’ reduction in cost, the opportunity cost to primary care is not factored in for the workload of GPs and pharmacists in dealing with switches and the potential health damage and costs caused by patients who have not had their medications on time. If this was to be factored in I would estimate it would obliterate the savings made, hence the cost to the system rather than individual pots may need addressing. This is potentially where PCNs may help, however, on a national stage there is little I feel the new changes will do. There is also commentary by many pharmacists about the gaming of suppliers and warehouse companies who deliberately withhold stock to drive up prices, then release them with a short use-by date to increase profits. Much of this is caused by the poor way pharmacists are renumerated for the cost of items particularly with the drug tariff rates which are often out of date when published due to the rapid changes. For this reason, I again state my challenge to our Secretary of State for Health and Social care @matthancock to work with organisations like the RCGP, BMA, GPC and RSPh to be bold and create clear guidelines for all how to manage these issues rather than pointless statements asking people not to stockpile, – given few seem to be listening and we are likely to be hit with challenges as Brexit progresses. Don’t forget to check out this week’s TipThursday on the best haematology app – Buku Haematology. I like this app and see why on the video below. Do you want to use technology to enhance your learning?